Halifax signed the Salford back rower Andrew Dixon on loan ahead of Sunday’s pre-season opener at Hull KR (3.0). Dixon, who has made 102 Super League appearances, including 67 for St Helens, has signed an initial month long agreement, although the timing of the deal - the Championship does not start until mid-February - suggests that will be extended. The 24 year old, who was expected to train with his new teammates for the first time last night, will not figure at New Craven Park but is expected to make his debut against Huddersfield at the Shay on January 24. 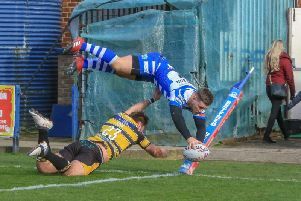 “Andrew’s a quality Super League player,” said Fax coach Richard Marshall, who had been looking for back row reinforcements. “He’s played a lot of games in some good set ups at Saints and Salford but he’s found himself on the fringes of selection at Salford and is looking for some game time. “He’ll need to earn his place like everyone else, but hopefully we can offer him that. “There were a couple of Super League clubs and a couple of Championship clubs chasing him so we’re happy he’s chosen to come here. “It’s no reflection on the back rowers we have, but he gives us another option. “He will add some go forward and he runs good lines out wide so he will give us a different sort of attacking option.